Julie and Charlie got married in a beautiful church garden in Goodwood, SA on a warm spring day. It was an intimate celebration of their love with approximately 20 people witnessing. I was fortunate enough to be playing some acoustic tunes while guests were arriving. The bride and groom decided to arrive together and received a big cheer from their guests. Julie had organised for the acoustic music and it was a surprise for Charlie – who loved it! Kate Brown fascinated a beautiful, relaxed and fun ceremony and both Julie and Charlie shared their own vowels, which made pretty much everyone teary. I continued playing acoustic music after the ceremony while guests were congratulating, the couple was taken pictures and having drinks with their family and friends. Around lunch time the couple and their guests headed off to continue celebrating in a tapas restaurant. It was such a friendly and relaxed wedding and I enjoyed every second of it. Thank you Julie and Charlie for letting me play a small part in your special day. I wish you all the best for the future. 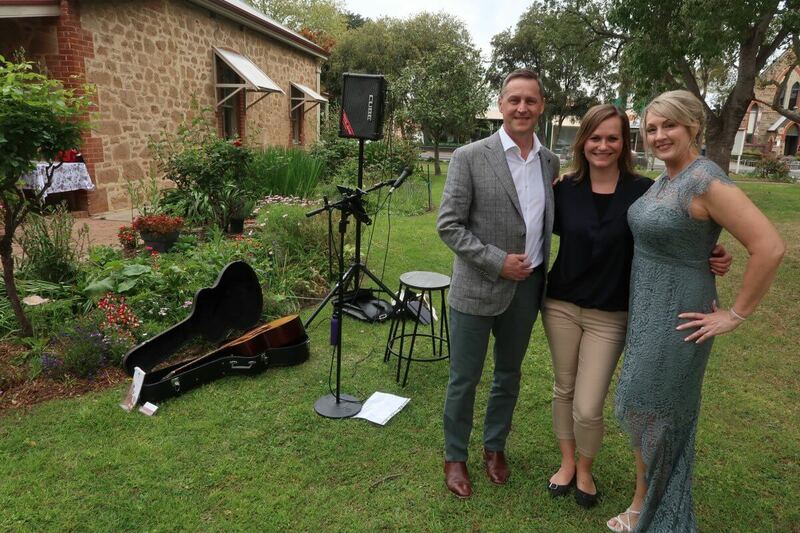 This entry was posted in Weddings and tagged bestweddingmusicadelaide, bridalwalk, ceremonymusic, ceremonymusicadelaide, gardenceremony, weddingmusicadelaide, weddingmusicsa, weddingssa.